Mosaic olímpic tackles Olympic studies from the wealth and interconnection of the different phenomena that constitute them: media and the new media, economics, legacy, gender, information management, Olympic urban planning, the role of the volunteers or the cultural programs, among others. The book also provides a new retrospective vision of the importance of the Barcelona’92 Olympic Games that has conditioned the organizational, management and global projection models of future editions of the Games, in a key way. This vision acquires new validity with the celebration of the 20 anniversary of the Olympic Games of Barcelona’92 and the pre-candidature of Barcelona-Pyrenees for the 2022 Winter Games that will inherit its legacy elements. Mosaic olímpic represents a nexus between CEO-UABs past, present and future. It considers the centres main academic contributions to the study and dissemination of Olympism thus far, and projects the centre into the future through new research interests, tools and methods of disseminating areas of knowledge already generated. Originally innovative, these areas of knowledge have stood the test of time and are subject to constant renewal. 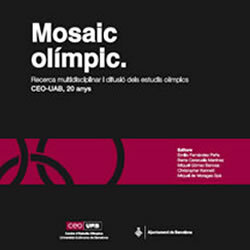 In more than 200 pages, Mosaic olímpic comprises 18 contributions of 16 researchers and collaborators of CEO-UAB throughout its first 20 years of trajectory, and the testimonies of 15 international academic collaborators that show the international projection and recognition to the research work and diffusion of the CEO-UAB in the field of the Olympic studies.